Desperately searching, Anna is determined to find her sister. 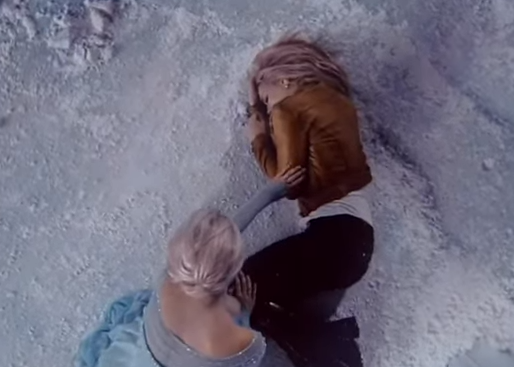 While this is happening, Elsa runs into Emma and is startled. Since it was such a surprise, she accidentally traps them both inside an ice cave. As they are stuck in the cave, the temperature is dropping. This places Emma’s life in peril. Over the likely break up, Regina is depressed. She secludes herself away from the town. This even included Henry. Henry is getting very sad from this. The rest of Storybrook continues on though. The residents consider Mary Margaret as their leader. She is faced with her first task, which is trying to restart the generator and bring electricity back into town. Elsa froze the powerlines, which damaged them. Back in the Enchanted Forest of the past, Anna tries to teach meek David to stand up for himself and fight Bo Peep. Bo Peep is a warload who is brutal and threatening to this mother’s farm away. These threats are if the family does not pay her price. White Out airs on Sunday, October 5, 2014 at 8 a.m. ET on the ABC Television Network.